Kratos returns triumphantly in a game that moves beyond previous series trappings, and elevates the whole experience to a whole other level beyond what it was. Reinvention: it’s often sought after by storytellers because of its inherent ability to call back to something familiar, while presenting it – hopefully – in an all-new light. Reinvention is not easy, and when it’s attempted without success, it’s often harshly derided. Sometimes, though, when approached with dedication, care, and craftsmanship, reinvention can be a powerful, effective method to make our old standbys seem as new as they were when they first came along. God of War, the fourth primary entry in the video game series started in 2005 and the eighth in the series overall, is one of the best, most positive examples of reinvention that has come along in the interactive medium of video games in a good, long while. It’s far from anything resembling a “partial” new take on a primary Sony-exclusive series, either. This latest entry has only narrative and character continuity from the previous games embedded into the new story being told. From top to bottom, every other aspect – from the game mechanics, level design, and even its very setting – are all entirely different from previous entries in the series. Still, simply being different does not necessarily make the game good. So, what is it about God of War that is so satisfying as both a video game experience and a story about a father and son? Let’s step into the realms connected by Yggdrasil and try to discover the answer to that question. Recognizable but far more highly-detailed than prior entries, Kratos' latest journey is the PS4's most visually advanced and stunning game yet. As the latest high-profile exclusive offering on Sony’s PlayStation 4 platform, a lot of expectation has been following God of War since its initial reveal at E3 2016. One thing that becomes immediately apparent when first starting up the game is that developer Santa Monica Studio put a great deal of time, attention, and effort into the graphical look of the game, resulting in the most visually impressive title to hit the PlayStation 4 in the system’s four-and-a-half-year history. Sony has been no stranger to pushing the limits of graphical fidelity on their exclusive offerings, particularly over the last couple of years. In 2016, Naughty Dog’s Uncharted 4: A Thief’s End was extraordinarily impressive due to its extremely realistic character models and breathtaking, picture-perfect environments. The following year, Guerilla Games’Horizon Zero Dawn left behind an aspect of realism in order to bring to life a paradoxically primitive, far-future post-apocalyptic expanse of natural overgrowth. Adding the increased horsepower of the PlayStation 4 Pro into the mix also brings higher resolutions beyond full-HD. Uncharted 4 was enhanced to run at 1800p, while Horizonruns at “checkerboarded” 4K for people with TV’s that can support display modes beyond 1080p. High Dynamic Range (HDR) adds entirely new depth to those games’ color palettes as well, giving them a pop that was previously not possible in the narrower color gamut of standard dynamic range. Immediately apparent in the graphical look of God of War is its advanced ability to combine all those previous benchmarks in prior first-party titles in order to make a demonstrable leap forward in the visual department. Checkerboarded 4K returns in this title, along with HDR support, but the realistic physics and more advanced lighting system all combine to help give the bombastic, sweeping environments of God of Warthe most impressive graphical presentation on the PS4 today, particularly if you’re playing on the beefier Pro model. Sound-wise, the game features a score that feels highly reflexive to what’s happening on the screen. From the (literally) earth-shattering battles on down to the quiet moments of solemn reflection from Kratos, Atreus, and other characters, the musical score as composed by Bear McCreary (Battlestar Galactica) feels like a beautifully designed accompaniment to both the story and action as it plays out. Sound design for the other aspects of the game world – from the crunching of snow beneath your feet, to the cracking of trees, to the “whoosh” of the Leviathan axe, on down to the booming baritone of the World Serpent – all add significantly to the grand scale employed in every aspect of the game’s design. Every single component of the visual and sound design demands praise because of the clear dedication to craft exhibited by all of the people responsible for their pivotal roles to play in making God of War look and sound better than, perhaps, any other modern game on the market today. The heart of the story is how Kratos tries to impart wisdom and — in his own way — compassion to his son, Atreus. While people very correctly point out that God of War is a significant departure from the norms of the series, it’s most definitely not anything even remotely resembling a “reboot” when looking directly at the narrative on display in this game. Yes, the setting is drastically different, as are many of the supporting characters and situations that you’re forced to encounter while playing, but the one element that anchors this game to the previous events and lore that defined the originals is the guy placed at the center of everything across them all: Kratos. This is still very much the god we came to know in games past. Still harboring the substantial scar across his stomach from being impaled by a tree at the hands of Ares in the first game, his skin is still permanently stricken with the ashes of his first wife and child, whom he killed because of deception by the original Greek god of war. Over the course of this game, Kratos privately, but knowingly, reflects on his past actions, and has apparently hidden in the forests of Midgard in an attempt to quietly escape his past, as the slayer of the gods on Mount Olympus. Many years later, Kratos has a new family in the form of a woman named Faye and their son Atreus. It seems as though he’s managed to go undetected by the gods of Asgard. Unfortunately, though, as we begin the game, tragedy has befallen the small family, and Faye has died. Worried about the prospect of raising his son alone but determined to honor Faye’s wishes, Kratos and Atreus create a pyre for her and prepare to collect her ashes to take them to the top of the tall mountain in the distance. On their long journey, Kratos will not only have to teach his son how to fend for himself, but will also have to break through the caring, softer exterior of Atreus in order to teach him how to “close his heart” to a necessary act of survival that Kratos is all too familiar with: inflicting death. Things are further complicated when an early encounter in the game makes clear that Kratos has, in fact, been compromised: the gods of Asgard now know that he resides within their realms. Staying one step ahead of them in order for he and Atreus to accomplish their final task for Faye will now be far more complicated. Even if Kratos isn’t happy about it, the gods’ awareness of his true nature means the task is something he and Atreus can’t accomplish on their own. One of the things that makes this story so particularly enthralling is Kratos himself. While in previous games he could hardly be considered anything resembling a relatable or even an admirable hero, clearly, he has a demonstrable change in attitude due to his desire to set a positive example for his son. Sometimes this manifests in surprisingly tragic ways, because in a moment where Atreus is sad about having to kill an animal, or wipes tears from his eyes as he remembers his recently-departed mother, Kratos lifts his hand as if he’s almost going to place it reassuringly on his son’s shoulder. When he ends up taking it away instead, you can’t help but try to tell him to show that small gesture of love instead of shying away from it. Kratos' natural weariness of strangers is sometimes compromised by Atreus' curiosity, but the former God of War will find both his caution justified, and his son's faith in strangers rewarded. Then, in other moments, you clearly see that though he’s somewhat tempered by the responsibilities of parenthood, this is still Kratos, slayer of Ares and former god of war himself. Beneath his stoic exterior is the godlike rage bubbling just below the surface, and it’s virtually impossible not to marvel at his displays of strength, speed, and sheer destructive power when he unleashes it, whether through a cutscene or because of the player’s own actions. While Kratos definitely feels a little more admirable due to the required temperance of fatherhood, the game makes it abundantly clear: if you’ve played previous games, you know what this guy is all about, and exactly what he’s capable of. 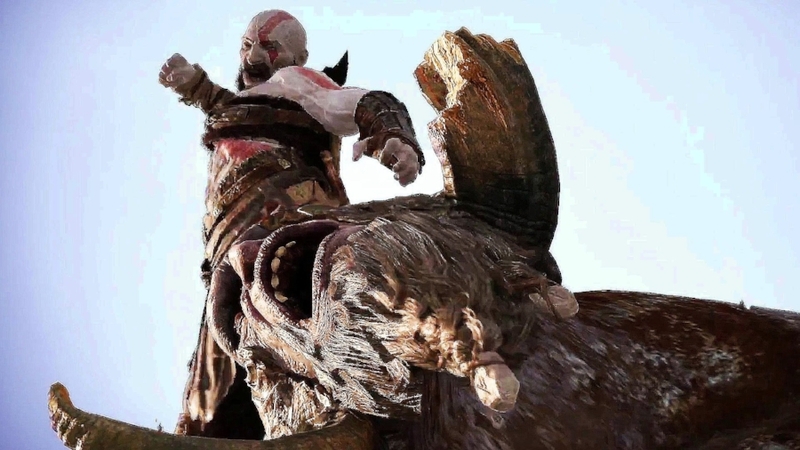 A brilliant vocal performance on the part of Christopher Judge (Stargate SG-1, The Dark Knight Rises) further emphasizes the greater dramatic potency that Kratos exhibits in this newest God of War entry. Kratos’ son Atreus is the player’s true emotional entry point into the story, though. While Kratos makes for an engaging and powerful player character, he’s not exactly the most emotionally honest guy in the game, only letting his stone-faced visage crack when he has a moment to himself after he realizes that the Norse gods have discovered he’s in Midgard. Picking up that baton of blunt and refreshing emotional honesty is Atreus, whose insight into the myths of Midgard and earnest curiosity about the world(s) around him helps to make you feel a sense of parental protection for him as you make your way on the journey. The story overall is truer to the old Norse myths than you’ll find in something like a Marvel Studios film featuring the God of Thunder, while also making good on the expansive, sweeping promise that the setting demonstrates great potential for. It feels like an epic of old in both presentation and execution, with the emotional moments often quickly punctuated by some thunderous battle, or a shocking revelation. This is a tale that deserves to be told on as grand a canvas as possible, and Santa Monica Studio brings every element — visuals, sounds, writing, and performances — to bear to deliver on the promise that is the story to God of War. One aspect that enhances the storytelling’s presentation is the unique and undoubtedly technically difficult method of using the game’s camera. Unlike a lot of other cinematic video games, God of War never cuts away. The camera, and the game at-large, is presented in one continuous tracking shot that moves in and out of focus, rotates around characters, and repositions itself behind Kratos’ back when the gameplay begins again. It’s a brand-new way for a game to come across, almost as if Kratos and Atreus are being followed around by a documentarian, capturing every magnificent moment of their journey for the benefit of the players. When your game takes a cue from the likes of Orson Welles’ famous tracking shot that opened his 1958 classic film noir Touch of Evil, you know that the storytellers at Santa Monica Studio were aiming pretty high. The combat on display in God of War is quite a departure from series norms, relying far more on skill and spatial awareness than the button-mashing nature of the original titles. Despite its narrative and character ties to the previous entries in this series, it’s here — in its most pivotal element — that God of War truly establishes itself as an entirely different beast altogether. While the originals were far more simplistic hack-and-slash action games operating off of a largely fixed camera position, 2018’s God of War is almost as if The Legend of Zelda: Breath of the Wild had a baby with Dark Souls: you have to be very present as you play through the game in order to be conscious of currency and elemental pickups, how best to optimize your resources and artifacts in order to turn them into tangible upgrades for skills and materials, and keeping an eye out for quick puzzles that could lead to some pretty consequential legendary items you can find along your journey. This is just one aspect of the experience, though, as the combat has also been completely redesigned with greater attention being paid to the overall depth of the action in a similar way. God of War’s combat system requires a great deal of spatial awareness and a finely-tuned repertoire of moves you can pull off both with the weapon at your side — which, for most of the experience is your Leviathan axe — as well as in hand-to-hand. Although the experience is far more complex, this game most certainly doesn’t skimp when it comes to a similar portrayal of Kratos’ brutality when dispatching his foes. Further depth is added to the game’s combat system through the employment of Atreus as a support character, who starts off with the ability to fire his arrows in order to both stun and distract the enemies you’re currently taking on. Later in the game, you can upgrade his gear and even his combat moves so that he can become a true force to be reckoned with, getting involved by jumping on enemies’ backs and letting loose a volley of more powerful projectiles to become a notable difference-maker in some of the later battles. The bottom line here is, do not overlook upgrades for Atreus. In specific moments, he can very easily be the difference between life and death for Kratos. Also notable is the very consequential spike in difficulty for this game when compared to the previous entries in the series. God of War on PS4 is demonstrably harder even on the second, “normal” difficulty. Stepping things up to the “Give Me a Challenge” difficulty will likely be punishing on a first attempt and is not recommended for your first time through the game, particularly if you had a hard time with the comparatively more simplistic originals. By that same token, don’t even get me started on the “Give Me God of War” difficulty. Perhaps if you’re already a master at a Souls game it may be worth a try, but other than that, it’s advisable to familiarize yourself with how the game works on “normal” before even attempting anything higher than that. All in all, the gameplay element of God of War constitutes the biggest, most visible and fundamental reimagining of the entire series, and the whole affair is far better or it. There is a lot to chew on here, and chances are you’ll love every minute of it. Few games can be as exciting, emotional, and as viscerally satisfying as 2018's God of War: a must-own title for the PlayStation 4. God of War is easily the most standout game experience of 2018 so far, and the best that the series featuring Kratos has ever produced. Its desire to maintain continuity with previous games on the story front while completely changing the way the game mechanics work is a solid move, giving an “in” to series veterans while also being extraordinarily friendly to new players. Even for newbies, you’ll get a fully-featured, complete, and powerfully emotional story with deep gameplay mechanics. If you’re a series veteran, though, then this game’s story serves as one hell of a culmination to the journey of a character you’re already very familiar with. Because of the perfect storm of factors that make this a truly memorable and surprisingly powerful game from the perspective of both seeing the story play out and pounding through dark elves, trolls, and other Norse adversaries, we have no choice but to bow to its greatness. It may not be perfect, but for our money, God of War comes surprisingly close.